Ok so it's not like I'm trying to promote Vogue patterns by any means but I feel this is important. Maybe it's just my Scottish half but a deal is a deal and I think you should know. Vogue patterns are on sale right now for $3.99! This is a big deal because Vogue patterns are some of the most expensive sewing patterns you can buy. 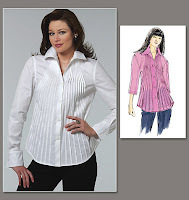 There's a shirt (Vogue 1165) designed by Sandra Betzina that retails for $27.50! Holy Crapes that's expensive!!! This makes me wonder, if you can buy Vogue for $3.99, would you ever pay full price? Why don't they charge a reasonable price to begin with and maintain the value of their product? I also notice the list price for the pattern is $27.50 but then it says "my" regular price is $16.50. Ok? If you're listening McCalls (who owns Vogue)... this is a bizarre pricing scheme. Great sale online as well...I just purchased three patterns myself. I always wait for them to go on sale because their regular price is just outrageous!! I agree with you...doesn't make much sense in how they market the patterns...if they can take such a drastic cut in price for the sale why play games with us sewists and not offer them at this price normally. I refuse to pay full price for their patterns. I had wanted one of the Vintage Vogue patterns a month ago and didn't realize it was a $27.50 pattern,YIKES, back in the drawer it went until their sale to purchase it. Ditto on the bizarre nature of their marketing. I make a list of the patterns I want to get and when I hear of a sale I take out my list. $27.50 for a pattern is ca-razy. Maybe their marketing strategy is that they know people love a bargain and if patterns are normally priced at $20 and up, people will buy larger amounts of them when they go on sale. I dunno -- just a thought. Sigh, they never go that low in NZ. Normal prices are now up around NZ$30 - $NZ40. In the sales we're lucky to get 'buy one, get one free' and only a few times a year. Even with exchange rates and postage it almost becomes more economical to buy online. Then again, maybe they make their money from impatient people like me who can only wait so long for a discount and end up paying full price. Its not what Joanns sells them for that determines the pricing. Vogue makes their money from the stores when they are sold/retailed. Vogues and all the others are sold at these prices as "loss leaders" meaning the store is taking a hit on the price to get you to come in and hopefully buy more stuff in their stores such as new fabric, zips buttons ect for your new pattern.